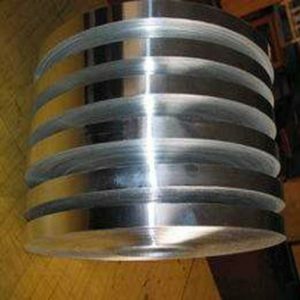 Color Coated Aluminum Strip Coil manufacturers have found that hard aluminum bands actually corrode when exposed to water, but at a much slower rate than annealed aluminum bands due to the protection of the oil film. We have tried it before: a roll of annealed aluminium strip is packed with water, and a day later, two sides of the strip are corroded by obvious water mark. However, a roll of hard aluminum strip was immersed in water and exposed for 6 months. It was found that the outermost layer did not corrode, but there was water corrosion in the roll. There is a certain amount of water in the air. When the cold aluminum strip is transported or stored in the high temperature area, the water in the air will condense on the surface of the aluminum strip. Water condensed on the surface of cold aluminium strip, the relative humidity (RH %) and aluminum strip with the surrounding air temperature are different when a case with the water, because the water amount is larger, the other aluminium strip will be affected with damp due to water evaporation. Haomei Aluminum found that water on the Perfect Cutting Edge strip surface will be as a result of the transverse crack interaction of inhaling aluminum strip, forming invisible to the naked eye 10 nm ~ 1 microns thin water film, the thickness of water film is metal corrosion is most serious and fastest area.